In the Aadhar card, there is a 12 digits number which is called Unique Identification Number. It is issued by authority of India named UIDAI- Unique Identification Authority of India which was formed on 28th January 2009. Aadhaar card contains both the demographic and the biometric details of a resident in India . These details store in the centralised database which can be accessible easily for any record. Aadhaar card serves as a proof of identity and address of anywhere in the country. Let us start the step by step process, how to apply for Aadhar card - Bangalore. Step 1- Go to this website uidai.gov.in. It is the official site of UDIAI. Step 2- At the homepage, you will see many options in header menu. 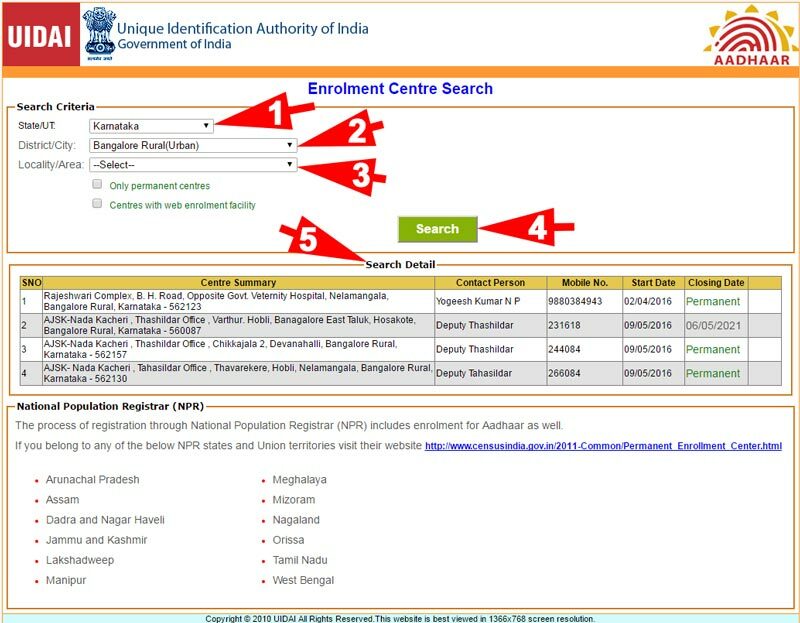 go to "Enrolment & Update section" and Click on "Aadhaar enrolment". Step 3- New page will open, Click on first link "Enrolment & Update Centers in Banks & Post offices". Step 4- Here you have to fill the required information like state, district, sub district, village town city. Step 5- Scroll down and you will see a list of banks and post offices address as per your above information. 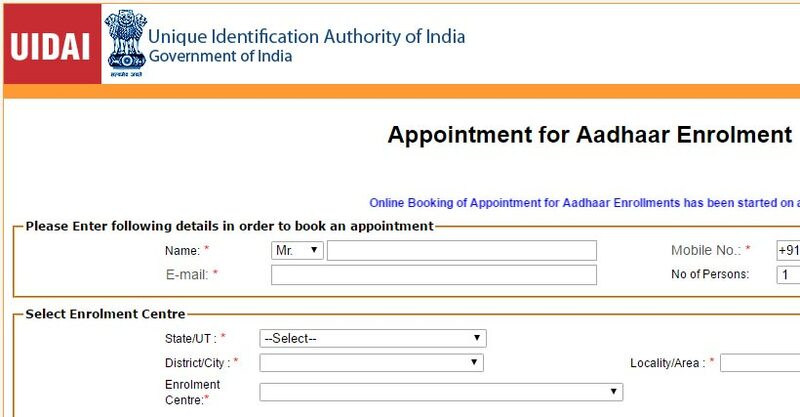 Step 6- Now UIDAI is stoped giving online appointment for Aadhaar Enrolment. So note that address and go physically to this center to enroll your Aadhaar card. Note: Below details are not working now. So Please don't follow. Fill your name in the first column. Fill your email address that is working. Fill the number of persons that are applying. Then select the Karnataka in the state. Select Bangalore in the district/city option. Select the enrolment centre which is convenient for you. Then fill the date and time in the next options which is convenient for you. Then there will be given a code which you have to fill in the box. Then click on the option ‘fix appointment’. Step- then on the next page there will be complete details of your fixed appointment. In the details, the address of the appointment centre will be given. All you need go there and your data will be collected for Aadhar card which will be received at your home by post within two or three months. While going to at the appointment centre take the required documents with you like address and identity prove, which will be asked to show you at the centre. 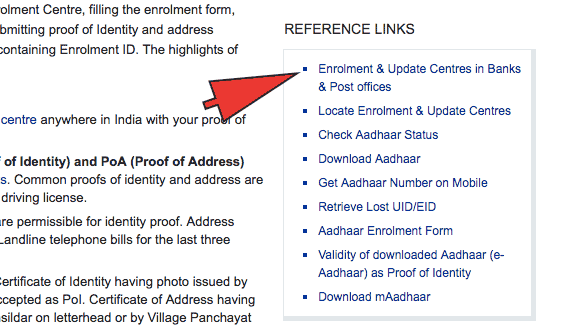 You can check the complete list of 18 options for address proof at the official site of UIDAI. For address proof, there is a complete list of 33 at the official site of UIDAI. In the aadhar card, your finger prints and iris scan and photo will be taken so pay attention to that and this is the reason these are called the biometric card also. When all the details will be generated you will be asked to check them if any correction is needed. Make sure all the details are correct. In case if any mistake comes in the Aadhaar card no worries you can update the change. Step 2: Fill your state State/UT, District/City and Locality/Area. Step 3: After filling all details click on search button. Below all search result will be be display.